PRODUCTS ON FARM ACTIVITIES WHAT'S IN SEASON? 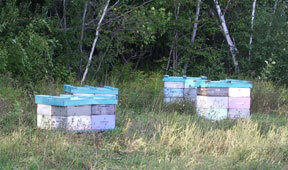 Keeping bee supplies for sale to other beekeepers began as our own operation expanded. At first we made most of the equipment from local lumber supplies. We soon realized how exacting had to be for frame parts and others to fit perfectly. We began buying some things from Ontario. When United Woodville went out of business in 1975 we began carrying supplies from F.W. Jones and Sons in Bedford, Quebec. Now we have various suppliers adding additional items to our list of supplies. Plastic frames and queen raising kits are two of the newest things. We ship supplies by bus, mail and other ways, but we prefer people come by the warehouse. We have over 50 years of experience keeping bees and have tried to keep up with the latest challenges such as varroa mites and resistance to Apistan strips. We like to exchange ideas and learn from other beekeepers what works for them. Click here for viewing on screen (requires Acrobat Reader).